The exoplanet HD 189733 b is one of the most studied ''hot Jupiters" to date. It is just slightly bigger than Jupiter, but it orbits over 180 times closer to its parent star, resulting in a roasting temperature of about 1,200 degrees. Every 2.2 days the planet transits the stellar disk, and a small fraction of the stellar light filters through its atmosphere, getting imprinted of its molecular constituents. Astronomers have used GIANO at the TNG, in its initial fibre configuration, to detect water at high significance in the atmosphere of HD 189733b during transit. It is not the first time that this measurement was achieved, however previously only 8-10m class telescopes had succeeded. Thanks to the novel design of GIANO, specifically the large spectral coverage, these observations are now possible with 4-m class telescopes too. "Thanks to the very high spectral resolution of GIANO" says Matteo Brogi, lead author of the paper and Assistant Professor at the University of Warwick, UK, "we can really observe each individual line of molecular species, in this case water vapour, and match them to models with a technique called cross correlation. Each molecule has a very specific pattern of lines, a sort of fingerprint, so it is relatively easy to identify which species is responsible for the observed spectrum." One additional complication is that water is also present in the Earth's atmosphere, and studies from the ground have often struggled with this strong contaminant. "Removing the signature of the Earth's atmosphere is indeed the most delicate step of the analysis", says Paolo Giacobbe, postdoc at the Astrophysical Observatory of Turin. "The very high resolution of GIANO helps us again, as it allows us to detect a shift in the planet spectrum caused by the orbital velocity of the planet measured along the line of sight. In contrast, the Earth's spectrum remains completely static during the observations, and can be consequently filtered out." The team behind this paper is certain that this is just the first of a series of successes. Alessandro Sozzetti, INAF Researcher at the Astrophysical Observatory of Turin, explains: "Our result enables the systematic use of 4-m class telescopes for high-resolution spectroscopy of planetary atmospheres. The TNG could play a fundamental role in the future, especially with the observing mode GIARPS that couples HARPS-N and the upgraded GIANO." "Understanding the true nature of exoplanets requires a systematic study of the largest possible sample." concludes Brogi. "This is golden territory for telescope facilities such as the TNG. When equipped with state-of-the-art instrumentation, they can rival the biggest telescopes on the ground, but with the additional flexibility that makes this kind of surveys possible." The figure from Brogi et al. 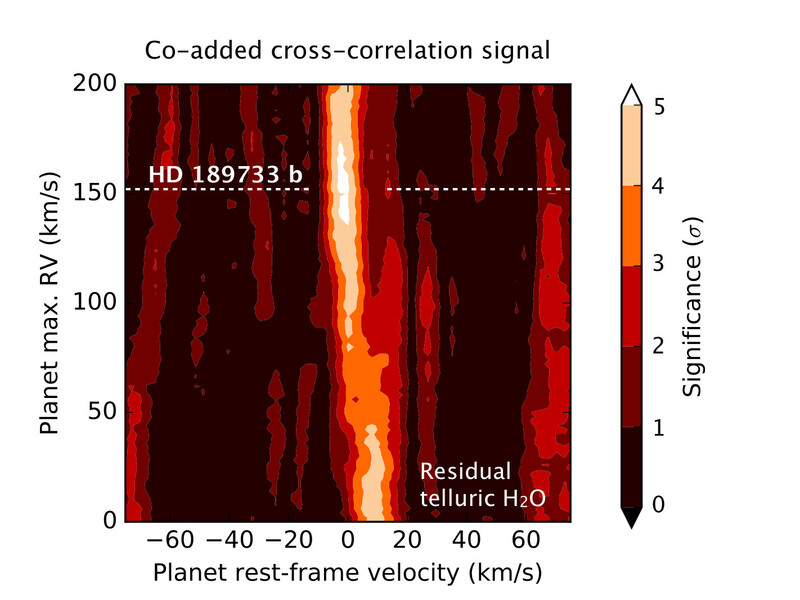 (2018), shows the total cross correlation signal between GIANO transmission spectra of exoplanet HD 189733b and a model containing water vapour absorption. It shows that the planet is detected at high significance (5.5 sigma) at the maximum orbital radial velocity expected from the literature (152 km/s, dashed lines), whereas the telluric absorption, static compared to the observer, appears heavily suppressed by the analysis, and confined in a disjoint region of the parameter space.